Friendship Loyalty and Prosperity are the cheif attributes to the Triple Hounds symbolism. Only those folks of means could afford to raise and keep hounds. The stsus of Hound ownership was not only social, as the practcal success in hunting was a very material benefit. The companionship and fierce loyaty of hounds were obvious personal benefits to owning these wonderful animals! This design is quite solid in Sterling and of good weight. The deep antique on this pattern makes the recessed areas look pierced through, but they are solid with no cutaways. 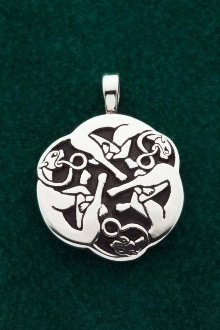 At about the size of a quarter, this design has bold presence for Women or Men to enjoy!